Your Doctor's Wife: What Does Your Husband Do? Last week this doctor's wife was out and about running a few errands. Over the course of the day, I found myself chatting it up with another woman as we waited in a long and slow moving checkout line. We spoke of small, normal chitchat; the weather and items on sale, with long pauses in between. There was no real bonding going on- just pleasantries. I paused a bit to think this through. She was a stranger. Did I really have to divulge this information? Do I really need to expose myself to the unspoken, underlying thoughts of "must be NICE", "she's rich", "she's got it made", yada yada yada. Because, then comes the follow up question which is even more damaging and nosy than the first one: "What kind of doctor is he?" To which the answer, a surgeon, conjures up visions of yachts and helicopters to some, not the reality of our 1997 minivan or our 2000 SUV who (yes, "who"- our cars have names) continue to serve us well. Yes, we have other newer, "luxury" cars, but nothing close to a Ferrari or Lamborghini, I assure you! So, do I open myself to this silent (and sometimes, not so silent) judgment of my life? I suppose I could have fallen back on my routine answer, "He works at the hospital." But, this time my brain randomly came up with a new answer. With an ever slight, somewhat confessional nod, I simply replied, "He sews." It was the first time I ever received a pity nod of the head and a despondent, "oh" reply. I loved it!! It's my new go-to response!!! I love it. Of course, you'll have to think of something witty to say if they ask what he sews. "Skin" would be either a dead give away or a quick change to another line! LOVE this!!! What an excellent response! I always hate answering that question because it does put so much assumption on us! I always hate the "oh well, you're a doctors wife". I am in no way better than anyone nor do I think I am. We've worked hard to get where we are! 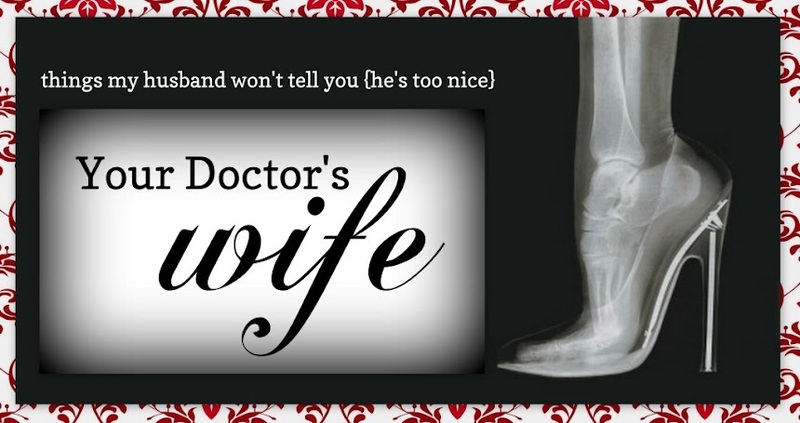 I completely agree that people stereotype what a "doctor's wife" is like. What we do, how we live and how easy it must be knocking back chardonnay over lunch with other doc wives. No, not so much. (Okay, I do get my hair and nails done, but that's just me, always has been). It makes me want to scream because I am not one to be identified as a spoiled rotten extension of my husband's job title. I myself attended an excellent university, hold a graduate degree and when I had to leave my chosen career behind for medical reasons, I did well with option number two, working in the entertainment industry. I was doing great and then...I met and married my husband, moved to a new country and my career goals got completely put on hold. I did get an admin job in the hospital but quickly found that everywhere I turned the nurses I worked with were huddled talking about "why she needs this low paying job, her husband is Dr....". The truth? Because I'm proudly independent and nobody would pay me what I was worth, so I was grateful to feel useful, productive and remember what Mondays and Fridays felt like. I was just the receptionist in a chemo ward, but it took me a year to get that job. It lasted only a short time, unfortunately, when our dog lost his sight. I sacrificed the job because he needs full-time supervision. And, yeah, honestly, we can live on my husband's salary. I'm not a snob though and my husband isn't one to think he's better than the rest of the world. He enjoys caring for his patients, the pay was never the attraction. But, I do hate to say I'm a doctor's wife because the images come up of what I must live like, should look like etc. I also try to avoid saying it because I immediately get evaluated from head to toe, god forbid a doctor's wife, sometimes, goes out in a pair of jeans and a Rolling Stones t-shirt! So, do I look like a doctor's wife, not really. And the work dinners and nights out also become embarrassing and odd when new people ask "and what do YOU do?" I found myself in with a group of nurses once at a holiday party, they all freaked out that I told them to call my husband by his first name in my company. They said it would be disrespectful. Here I thought I was bonding over gin and tonics with nice ladies and found they all consider my husband the boss. I didn't even consider practice hierarchy. I was being social. 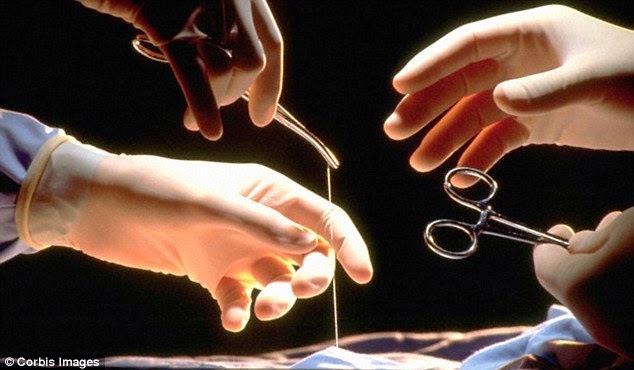 It gets worse when people ask further questions or say things like, "his parents must be proud" and I have to consider if I should admit my father in law is a well-respected surgeon. It's awkward. In our community, I'm treated slightly different once they find out who I am or know who I am. If I have a prescription, the pharmacist goes crazy making sure I don't wait half a minute. It's embarrassing and it creates a sense of shame for me. I never sought to be Mrs. Dr. S. I was proud of my career. Because it's easy to be judged, I do usually keep it to myself. he sews! haha... you got it! Or you could say that he works in non-durable medical equipment. You know, the stuff used to make stitches with. If your husband has a contract with a hospital, just say they are a contractor. Depending on the area, that works good here as there are contractors who work for the military, govt., etc. If you say 'just a contractor' and its not home building, most don't care. You can also say paperwork stuff, as I don't know any doctor that doesn't sub as a secretary in reality for at least 20% of the job. Ahh yes so relatable! The worst is when I have contractors come to the house for estimates and they ask. Knowing if I answer truthfully then our estimate doubles. I'll have to use your sewing line next time ;) Welcome back to blogging too missed you! So I obviously came late to the party for this post, but I stumbled across it today and literally SNORTED when I read your response to the dreaded hubby-occupation question. Although I unfortunately won't be able to use your answer myself (husband is a psychiatrist), I will now spend the rest of my afternoon trying to think of something equally witty. ;) Thanks for the laugh! Try answering that at the PTA meeting when you're husband is a child psychiatrist. I can count my true mom friends on one hand!